If you’re a frequent flier then make sure you’re signed up to the airline’s loyalty scheme. With most airlines, the more you fly, the more points you gather, and points mean cheaper flights, sometimes even free flights, upgrades, and a more streamlined experience. I’ve only flown to New York a couple of times recently, and have already been bumped up from Blue to Bronze, so hopefully with a few more flights i’ll work my way up. The best you can get is the BA Gold Card which often means you get bumped up to first or business class. Woohoo! This is a dangerous one. The monetary rewards are quite slow to build up (unless your a bit of a Space N.K obsessive!) at just one point per £1 that you spend, but you also get complimentary samples with your shop, invitations to in store events and other benefits by being a card holder. Once you get 100 points, you get a £5 voucher to spend in store. Hey, every little helps! Again, less about the actual monetary rewards, and more about the extras that you get. If you work or live near a Waitrose (or Little Waitrose store) then you can get a free hot drink whenever you pass the store if you have a MyWaitrose card, as well as money off selected items. All those free cappuccinos sure add up to a big saving if you skip the usual Starbucks! The John Lewis card also tempts you into the store by sending you a monthly voucher for a free hot drink and cake. I always make sure to use it up, it’s so nice to have a pit stop during a mad shopping trip and enjoy a pot of tea and either a Lemon Tart or selection of Scones in the store! For me, this is the best loyalty card as it seems that not a month goes by when I don’t keep the rewards! Boots is one of those places where you buy your essentials as well as those little treats so the points soon add up. With a huge 4 points per £1 that you spend, they soon tot up, and when you have 1000 points, you have £10 to spend in store. Plus, with the coupons that you receive in the post, or at the back of the Boots Magazine, they often get doubled. As well as the money off, there’s the additional treats like daily deals and a free magazine too! I used this more when I lived out of London and had a car, as BP petrol stations offer Nectar points, but now I use it mostly for my Sainsbury’s shop. Collecting two points per £1 that you spend quickly adds up on your weekly shop, and you can spend your points in so many ways. As well as money off your supermarket shopping, you can earn and spend points in Debenhams, on eBay, on Expedia… the list is huge! I don’t use this card as often as I should, because this card has some great perks. Not only can you collect points on beauty purchases, but you will also get treated like a VIP whenever you enter the beauty hall; free samples, makeovers, event invitations and apparently even a free Benefit Brow Wax on your Birthday, but I’m not sure how you go about getting this as I’ve had my card for two years and am yet to get a free Brow Wax!! 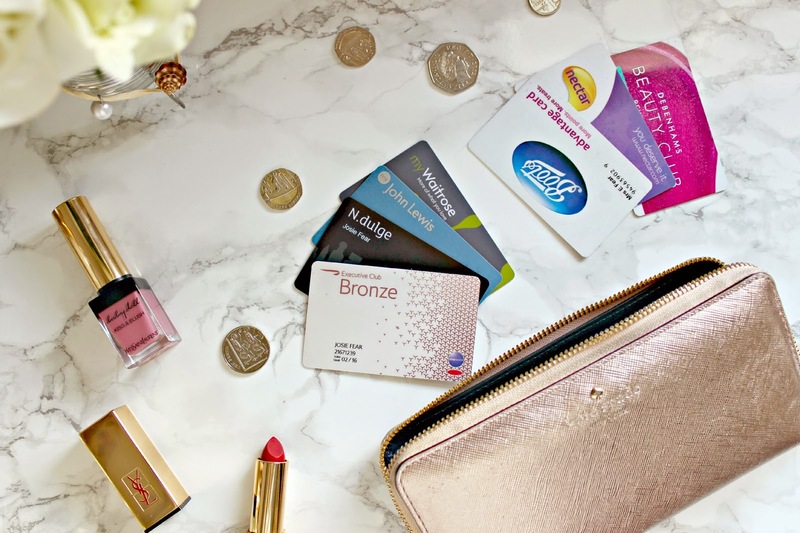 There’s so many beauty loyalty cards out there, and these are just the ones that I use the most and love, but I’d love to know which are your favourite loyalty card schemes!